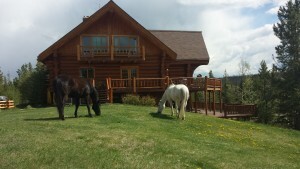 Campbell Hills Guest Ranch is a small, all-inclusive Guest Ranch on a private 160 acres. Located 25 min. from Downtown Kamloops and nestled amidst open meadows, and timbered mountains in the heart of the interior of Beautiful British Columbia. Premium quality food, western hospitality, privacy, customized programs, max 5 riders per wrangler on trail rides are our basic standard. We will set you up for the perfect ranch vacation. Our smoke-free lodge features the Wild Horse Saloon, a commercial open kitchen, a fully licensed bar, a lovely porch overlooking Campbell Lake and beautiful Monte Hills. upstairs a games room & 2 beautiful cozy rooms plus Bunkhouse overlooking Campbell Lake / Ranch-Arena & Forest. 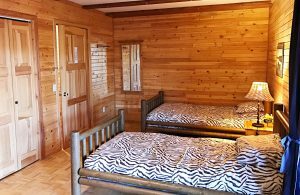 Each room features a king size hand crafted Log bed and a full private bathroom & offers tastefully decorated south-western furniture. In addition to the Lodge we have 3 smoke-free Cabins for families or friends. Decorated in a warm western style living room with a cathedral ceiling. The separate bedroom comes with a queen size bed, an additional sleeping loft with two single hand crafted Log beds & a full bathroom. Maximum occupancy of a Cabin is 4 to 5 people. Horses are our Teachers! Horses don’t care how much you know, but they know how much you care! We use the Natural Horsemanship philosophy, based on the principles of Tom & Bill Dorrance, Ray Hunt, Buck Brannaman and Pat Parelli. Relationship and partnership are very important on the trails. We need to trust our horses and our horses need to trust their rider. We like to encourage our guests to participate with the handling of our horses. 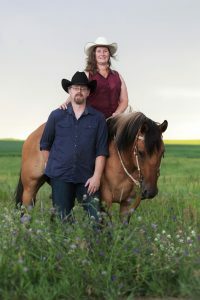 Our natural horsemanship approach starts with how we catch the horse. Daily grooming, giving them a bath after a hot day ride are all part of the horse experience and keeping it natural gives it a harmonious dimension for both rider and horse. The first ride starts in the Ranch Arena, where we will share how to communicate with your horse, the basics and safety on the trails. All our horses do not have bits in their mouths, we make use of Bosals and Hackamores. The extensive trail system is suitable for both beginner and intermediate/advanced riders. We will make sure we set you up for a great ride during your ranch vacation! Our rides will take you to beautiful Lakes, Forest Trails, Natural Meadows, Hill Tops and View Points! Our Wild Horse Saloon is the place where we all eat together. You can socialize, relax in front of the fireplace, or play Pool, Poker, Fuss ball, Air hockey or watch a movie in our Games-Room! The cheeriest chef (Martin) in the West will greet you every morning and evening. Every meal is prepared with pride. If you’re hungry around here, “It’s your own fault!” You’ll enjoy fresh breads, salads, fruits, vegetables, & freshly baked pastries. Campbell Hills Guest Ranch is the perfect seasonal get away to get in touch with horse and soul through natural horsemanship. Enjoy horseback riding, mountain biking or hiking in the wilderness. Spend an afternoon Kayaking on Campbell lake or bird-watching. We offer ‘rent the ranch’ for family reunions, bachelorette groups or other special life events or just take advantage of plain rest and relaxation! Visit Sundance Guest Ranch. The first time, it’s a vacation – after that, it’s coming home! Just four hours from Vancouver. Saddle up for two daily sessions of exceptional riding through sage-covered hills, alpine meadows, and river canyons. With a herd of over 100 happy horses, we have the perfect horse for every rider, from total beginner to the most accomplished horse person. You may choose to ride grouped according to ability (beginner, intermediate, or advanced), or simply ride with friends and family. Either way, you will ride in small groups guided by friendly wranglers who will show you all the best trails and make sure that your experience is both fun and safe! Our facilities include air-conditioned rooms, a large heated swimming pool, Bring Your Own Bottle bar lounge, movie lounge, games room, and billiard room. We are famous for our food! Enjoy delicious meals ranging from sophisticated international cuisine to hearty ranch barbecues. We host Saturday night country rock DJ dances and special weekends throughout the season. Come and explore our amazing landscapes and enjoy our western hospitality. Experience an intimate, hands-on horse adventure with riding lessons and natural horsemanship clinics included in your stay with us. With a maximum of only 12 guests, we promise that your ranch and riding experience will be exactly as you plan it. We guarentee small and intimate riding groups, always tailored towards your own specific needs with no tedious ‘nose to tail’ action out on the trails. Free Rein Guest Ranch is surrounded by boundless Crown Land so we literally have tens of thousands of wilderness acres for you to roam. Pack up your saddle bags and get ready to head out for days crammed with adventure, taking a swim in a secluded lake, a picnic by the shoreline or simply enjoying a snooze in the shade. You can explore remote and stunning landscapes with your horse to encounter dramatic vistas, search for cattle on the range, take a kayak for a spin on our lake or simply hang back at the ranch and relax. We really do give you free rein to decide how you spend your days with us. Welcome to Echo Valley Ranch and Spa, a spectacular western adventure, and a superb sanctuary of first class accommodations, healthy, farm-fresh meals and world class spa treatments. Enjoy an enriching diversity of soft adventure activities. The perfect setting for fun, adventure and relaxation. The Big Creek Lodge is a working Guest Ranch, established in 1985, in the heart of the Chilcotin Country, a remote region east of the Coast Mountains in the Cariboo Regional District, in British Columbia, Canada. In 2017, the former owners retired and the Big Creek Lodge as well as the Ranch were sold. Now under new management, Shona and Karl are excited to share an authentic Wild West experience with new and familiar faces! The lodge is located approx. 2-hrs drive from Williams Lake Airport. Transfer is available – no rental car needed! 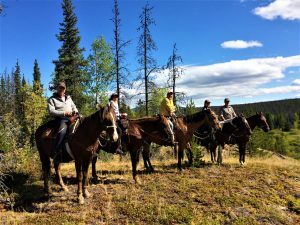 Since Big Creek Lodge is a working horse ranch, we can offer a full program of activities, including trail riding, cattle work, cattle drives, and round-ups, plus excellent fishing, wilderness hiking, lariat throwing and much more. When going for a trailride, we will ensure the “best fit” and give you an introduction in our arena in order to make sure that you and your 4-legged friend perfectly match! What is often forgotten, Big Creek Lodge is also a great winter location. We also offer a special program for photographers, birdwatchers, wildlife enthusiast, and those simply seeking solace and the tranquility only the wilderness can provide. Big Creek Lodge is open year-round so you can enjoy a full range of activities in a breathtaking Western Canadian wilderness that changes with each season. Our 25,000 acre range in BC’s Chilcotin region is full of wildlife, and depending on the season, you might see bear, deer, moose, eagles, wolves, and countless species of birds – from the charming hummingbird to the impressive golden eagle. Plus, there are up to 1,000 wild or free-roaming horses in the Chilcotin today. There is a roomy common lounge and a dining area warmed by a massive stone fire place. Our home-style country kitchen serves delicious breakfasts, lunches and dinners in a relaxed, comfortable atmosphere. Hearty lunches can be packed for your fishing expeditions, trail rides, daily excursions, and other activities you take part in. All of the rooms and cabins at Big Creek Lodge have earned a Canada Selected “Four Star” Rating, indicating that our property offers exceptional accommodations with an extensive range of facilities, guest amenities and services. The cabins are nestled among the trees bordering Big Creek, giving you a feeling of remoteness that you’ve always imagined. Most rooms and cabins have a balcony or porch, so with just a small step through the big glass doors you can see the mountains and wilderness and enjoy the fresh, unpolluted air. Floor heating keeps you warm throughout the winter months. What could be better than enjoying the breathtaking view from our sundeck or Relaxing in our outside hot tub? Our outdoor camp at Fire Creek, at the foot of the Coast Mountains, is the perfect destination for overnight riding trips. But whether you want to spend some time outdoors in search of adventure or simply relax around the Big Creek Lodge’s roaring evening fire with a good book, you will create lasting memories with us. Come and meet us @ Big Creek Lodge!